Cleaning your tires regularly is not just for appearances. 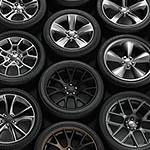 You should clean your tires to prevent brake dust buildup as well as other debris that can get into the carbon fibers, making it more difficult for your tires. When you wash your vehicle, you should always clean your wheels before any other part of the car. This is crucial to saving time and energy, as you’ll only kick up grime from the tires onto your vehicle. This is why you clean them first. Secondly, you want to use a product like Wolfgang Tire and Wheel Cleaner because it can clean any type of tire, including those that are coated or anodized. You want to make sure that you don’t leave the cleaner on too long so that it dries. For this reason, you should do one tire at a time, or if you have a hose, you can do them in sets. In addition, keep a microfiber cloth on hand to dry off your tires when you’re done with the rest of the wash. You can get an expert wash and detail when you visit Anastos Motors.